Trying to get the best price on air travel is a confusing and frustrating process. Flight prices are less transparent and fluctuate more than almost anything else a consumer buys, and airfare is one of the most expensive purchases that a regular family makes. All these questions causes plenty of fear, uncertainty, and doubt. Consumers typically spend almost two weeks comparison shopping and end up spending nearly 5% more than when they started looking. Even after all the comparison shopping, they're not confident they got the best deal, and end up buying a ticket out of frustration with the process. Our team at Hopper analyzes billions of flight prices daily, and have been studying the complexities of flight pricing. Our new app brings that expertise to your mobile device in order to help save you time and money. Today, we're excited to introduce the Hopper app for iOS 8 devices. 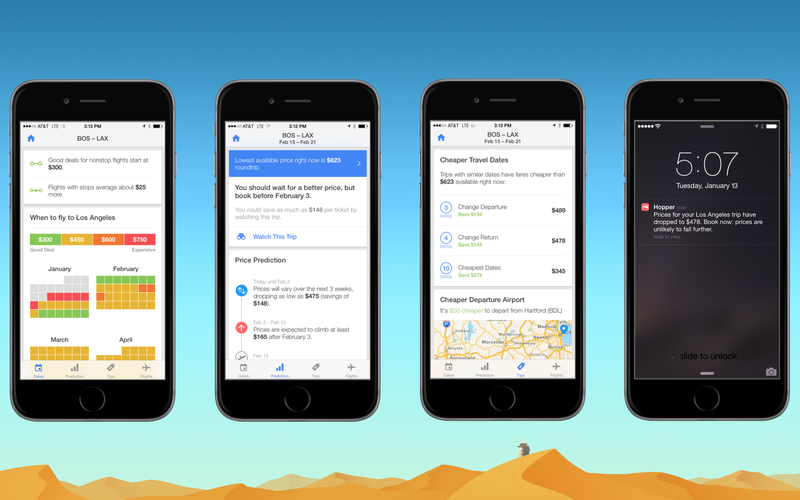 Here's how Hopper is like having a super-fast, all-knowing travel agent in your pocket. Hopper predicts future prices by analyzing historical price data and advance purchase curves for similar trips. Hopper's Price Prediction will advise you whether to book now or wait for a better price. It also provides a timeline of exactly how we expect prices to trend. About a third of the time the current price is the best it's going to get, and the app will advise you to book now; more often—two-thirds of the time—the price for your trip will be lower at some point in the future. In 95% of cases, following the advice from the Price Prediction will get you a cheaper flight or at least the same price as found in your initial search. All the variability in prices means there are good deals to be found, but there's no best day of the week to book, contrary to popular belief: consumers following lose out because they're only spot-checking prices occasionally; Hopper found that by monitoring continuously, there is often a price 5-10% lower even within 24 hours. By selecting to Watch a Trip, Hopper will monitor prices 24/7 for you and will alert you if prices drop or are expected to rise. The earlier you start watching, the more likely you are to be alerted to a deal. On some routes, you could save upwards of 40% over the best price from your initial search. There are a lot of other factors that can influence the price of your airfare, such as your travel dates and airports. The When To Fly calendar includes color-coded dates so it's easy to identify the best times to travel. Hopper also provides recommendations like switching your travel dates or airports to help you save more money. The tips tell you exactly how much you could save by adjusting your trip. If you want more information on the data behind Hopper and how it works, you can find out more from our Chief Data Scientist, Patrick Surry: http://www.hopper.com/research/bunny-saves-money/. We are pleased to share that Hopper has been named to Fast Company’s annual list of the World’s Most Innovative Companies for 2019.